Sustainable design isn't about cool green gadgets. It is about doing what we already know to do, and doing it well and with awareness. "Green building" or "sustainable design" is now part of the standard of care that a landscape architect must deliver to the landscape architect's client. One reason for this: "Green building"/"sustainable design" is now encoded in the AIA typical contract between architect and the architect's client. This contract also typically governs most landscape architecture practiced in the USA because most landscape architectural design services are provided to the ultimate client via the architect - architects are usually the lead on projects. Actually the phrase used in the contract is "environmentally responsible design" and it is repeated twice, including "environmentally responsible design approaches", "environmentally responsible design alternatives", and emphasizing "material choices and building orientation". A landscape architect's aesthetic sensibility and approach is not something that the profession seeks to control. However as a regulated profession landscape architects are responsible to ensure safety, security, and human welfare. Lack of reasonable care (failure to perform) may result for example in personal injury or economic loss for which the non-performing landscape architect may be liable. This is worded differently in different sources, but this is the general idea. 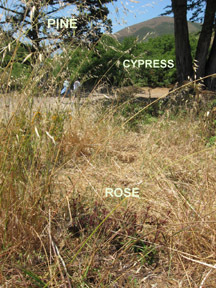 Not far from the rose are a Monterey Cypress and a Pine, both of which were planted. There is also remnant wood fencing and an old wood structure close by – so this particular area had some use a hundred or more years ago and perhaps right up to the time it became part of the Golden Gate National Recreation Area. Tennessee Valley was settled and used by Portuguese dairy farmers – perhaps this was the location of a ranch house. Speaking of invasive it is worth noting that the National Park Service has a regular program of habitat restoration and invasives management in the Marin Headlands. Many visitors to the Marin Headlands think that the area is wild and "natural", without realizing the amount of care, thought, and real work that the NPS puts into maintaining it. This is a cultural landscape, and the roses are part of it. The Requirements for this credit are pretty simply stated, that is, to develop on a site identified as contaminated or classified as brownfield and effectively remediate site contamination. What are the implications for landscape, site, and garden? Every municipality and state or province has disturbed lands that are obsolete or abandoned landfills, industrial mills or factories, quarries or mines, power-generation plants, military bases, airports, ports, or even residential and retail storage of petroleum and chemical products. Technical remediation would be necessary, of course, to cleanse them for further human use. In addition, however, the very character of any new development that to be built in these old disturbed sites will almost certainly be affected by the toxic history of the place – whether the development is residential, commercial, industrial, recreation, park, or passive open space. Many landfills today are sealed and turned into parks with only the occasional vent to remind conscious visitors of the seething or at least unsettled materials 18” below them. However, nineteenth century parks were typically intended to create psychological therapeutic effects through opening up natural areas – not old dumps – and scenery and creating opportunity for social interaction. What kind of restorative experience can you have on a pleasant Sunday afternoon with your wife /husband, two kids, and your dog picnicking and throwing a Frisbee around on an old landfill? To effectively address the nature of such places the design must treat the history of disturbance as one of the sources of inspiration for the landscape, site, and garden design, along with user requirements. A strange beauty can result that would otherwise never appear, a beauty that nevertheless connects us with our cultural history and grounds us in the moment and place. Elizabeth Meyer, “Uncertain Parks” in Czerniak and Hargreaves eds. Large Parks 2007. The USGBC’s LEED is a program of land and building development practices whose goal is to achieve sustainable green building www.usgbc.org. The LEED Reference Guide LEED for New Construction v2.2 organizes the practices into five categories, including Sustainable Sites, Water Efficiency, Energy and Atmosphere, Materials and Resources, and Indoor Environmental Quality. Required practices (“Prerequisites”) and optional practices (“Credits”) are listed in each category. Green building projects are certified by the USGBC according to how many Credits are achieved (on top of the Prerequisites). Many of the practices have implications for landscape, site, and garden construction and maintenance. Some implications are obvious for example requiring use of efficient irrigation systems and native plants. Some implications are less obvious, going far beyond the immediate requirements of a Prerequisite or Credit. For example the Intent of Sustainable Sites Credit 2 Development Density and Community Connectivity is: “Channel development to urban areas with existing infrastructure, protect greenfields, and preserve habitat and natural resources.” The Requirements to achieve this Intent include: Construct or renovate building on a previously developed site, either in a community with a specified minimum density (Credit 2.1), or within a residential neighborhood with a minimum density and local community services (Credit 2.2). Implications for landscape, site, and garden: This credit encourages concentration of new development within areas of existing development. The intent is to reduce the need to construct new infrastructure, and to protect greenfields, and preserve habitat and natural resources. Care should be taken however – by municipalities and higher levels of government and by developers – to protect urban and suburban stream and upland ecological corridors and significant natural areas. As development expands it tends to engulf open space areas, but these remnant natural areas, now surrounded by development, may continue to function as plant and wildlife habitat. Infill development should not sever ecological corridors, nor eat away at the edges of natural areas to the extent that the habitat or special natural features of the area are compromised. "I only regret my economies"
Last night on Charlie Rose author Reynolds Price told the following story. On one of his last days at Oxford he visited one of his professors to ask for words of wisdom to take with him as he left. This professor recounted his mother's last few moments of life. The professor had gone to visit her. On her hospital bed she had been unresponsive, so he kissed her on the forehead, turned, and walked across the room to the door. The door squeaked slightly as he opened it and apparently this was enought to rouse her. She called out to her son: "Neville". He stopped and turned. She had roused herself and propped herself up on her arm. She said to him: "Remember this - I only regret my economies". What are social web strategies for architects, landscape architects, and others in the AEC industry (architecture, engineering, construction)? It is a big industry, to say the least, and the one most affected in the current economic downturn. Firms and companies in this industry with a Web 2.0 strategy as the economy turns back up will be ahead of the game. The industry has some curious features: for example it is extremely conservative but once a new technology is demonstrably useful it becomes pervasive, cf. AutoCAD. Maybe project management and file storage as parts of collaboration software with Facebook-like user interfaces is where things are usefully headed at this time. The five gardens that I visited are simple in concept but exacting in quality and arrangement of plant material. There are only a few different kinds of gardens in the world, as suggested by Moore et al in The Poetics of Gardens MIT 1988 – collections of things is one of these forms and many of the native plant gardens on the tour are second to none as collections, though they are mostly new gardens. The gardeners who create and maintain these gardens, and especially those who open their private gardens to the public, are unsung heroes. Native plant gardeners create a demand for native plants as garden material, and they are also “thought leaders” bringing inspiration and encouragement to many aspiring gardeners. 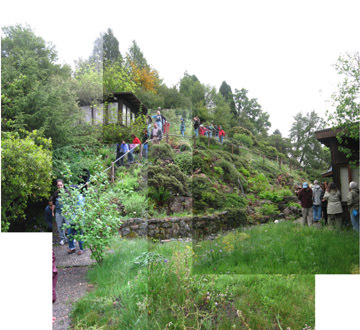 A magnificent native plant garden was begun by a couple named Jenny and Scott Fleming in Berkeley fifty years ago. Jenny, who passed away a year ago, worked on her garden every day. It shows. The garden is about a half-acre in extent but consists of a steep slope that was cut back beyond the angle of repose to create a building site for the home. So Jenny and Scott imported a lot of stone from Shasta Mountain and built retaining walls and structures. The stone is lava rock, full of air holes, much of it red, the color of brick. And in fact I thought some of it was clinker from a brick plant. The relatively narrow space between the slope and the house has a barbecue terrace, with newer paving, not Shasta stone. There is also a hot tub pool – and one of the tour docents recounted enjoying that pool thirty years ago while living at the house as a student while Jenny and Scott were on sabbatical in Oregon! The central feature in the planting area is a watercourse with circulating water. The water was turned on for the day of the tour. The falling water animates the planting composition. The plants are mounded and layered beautifully, and the overall appearance is one of a studied naturalness, a just slightly surreal-natural condition. When visitors would comment on the beautiful and naturalesque placement of plants Jenny’s response had been that it was a lot of fortuitous accidents. Many of the plants in the garden were collected by Jenny and Scott although many came from the native plant garden in Tilden Park. For example the garden has a low shrub variety of Arctostaphylos, native to San Francisco. This plant is now extirpated anywhere in the wild, it exists only in gardens around the Bay Area. There is a sprawling variety of Ceanothus thyrsiflorus, called C.t. repens. Apparently C.t. hybridizes in the wild easily. This one has large soft leaves, about 1” long by 1/2” wide, whereas the shrub form has leaves barely 3/8” long and quite brittle. Jenny and Scott were charter members of the California Native Plant Society. http://www.cnps.org While their house was being completed they used to take walks in Tilden Park and became inspired to use native plants in their garden from the native plant garden there and its eccentric gardener. When that garden was threatened with closure Jenny and Scott organized some like-minded friends to lobby for its preservation. They succeeded and the garden is there to this day. After that battle was won, what to do with their meetings? So they started the CNPS. CNPS is today a multifacted, strong organization for native plants and habitat restoration, etc. Chaparral is the name of the ecoregion that extends from Baja Mexico to northern California along the coast and in towards the Sierra Mountains. The ecoregion gets its name from the Chaparral plant community, which is dominated by shrubs: Scrub oaks, Toyon (has red berries, looks like holly if you are in a hurry, and Hollywood gets its name from this plant), Sage, Coyotebush, Manzanita, Chamise, etc. - lots of plants that you would recognize if you happen to live in this part of the world. The name comes from the Spanish word "chaparro" meaning green oak. Chaparral is often pretty dense brush - them leather leggins that cowboys wear are "chaps" to protect their legs as they ride through. Great article about Chaparral at Wikipedia http://en.wikipedia.org/wiki/Chaparral . The Chaparral ecoregion also includes tree-dominated plant communities, some of which don’t at all look like the Chaparral plant community, so this is a bit confusing till you see these plant communities out in the field in great interdigitated swaths. I spent much of today hiking through 200 acres of Central Oak Woodland plant community which transitioned to Chaparral, and both of which descended to a riparian plant community at the valley bottoms (in Mendocino County, California, USA). Although aspect plays a part in plant community dynamics it is relatively minor. For example a north-facing (cool) slope Chaparral community might have more Toyon and Oak while a south-facing (hot) slope also has Chaparral, though you might find more Chamise. Far more important is the depth of soils. 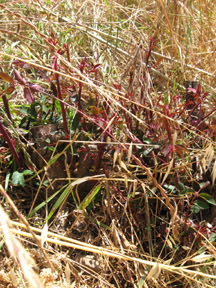 Shallow soils – Chaparral. Deeper soils – Central Oak Woodland dominated by Blue oak, much deeper soils - Central Oak Woodland dominated by Black Oak, which drops a lot of leaf litter and as a consequence builds up an even deeper soil. It is no accident that some of the best vineyard terroirs in Napa, Sonoma, and Mendocino Counties are on sloping sites that used to be Black Oak stands.